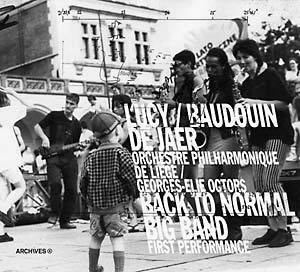 This double CD release brings together two founding pieces from Baudouin de Jaer: the first volcanic concert of Back To Normal in 1991, and the first concerto of Baudouin de Jaer, "Lucy", performed in 1993. Back To Normal was a collective of visual artists, musicians, and non-musicians. "Lucy" is played by the Royal Philharmonic Orchestra of Liège. In 1993, Baudouin de Jaer wrote his first concerto for violin and orchestra. "Lucy" was premiered by the Royal Philharmonic Orchestra of Liège under the direction of Georges-Elie Octors. Equipped with two dictaphones, Jaer steps in the dreams of half-sleeps and awakenings. Nestled in a cutting of 15 sections, the recorded ideas then slips the whole in a telescopic sound structure that the Royal Philharmonic Orchestra of Liège propels the evening of the first in space time. Coordinated by Baudouin de Jaer, the movement Back To Normal (born in Liège, Belgium) gathered, between 1991 and 1996, a dozen artists, painters, sculptors, ironworkers, and some musicians of the Royal Conservatory of Liège. Everyone transmitted their knowledge to others, composed their pieces and directed them. Touring France, Poland, and Switzerland, 80 people participated. The recording here features: Pierre-Etienne Fourré, Slavek Kwi, Jean-Yves Evrard, Eric Sleichim, Yves Kimplaire, Patrick Tillie, Collective Composition, and Eric Sleichim. Baudouin de Jaer studied composition with Philippe Boesmans, Henri Pousseur, and Frederic Rzewski, and at McGill University (Montréal) with Bruce Mather. His works have performed by the following ensembles: Synonymes, Besides, Arditti, Quadro, Stream, Ear Unit, Musiques Nouvelles, Orchestre de Mulhouse, National Korean Orchestra, Orchestre Philharmonique de Liège, Timf Seoul Ensemble, Korean Project, Ensemble 21, Ensemble 88. In 2010, he resolved the enigmatic music system of Swiss artist Adolf Wölfli and released a CD called The Heavenly Ladder on Sub Rosa (SR 312CD). In 2010, Baudouin de Jaer was awarded a prize from the National Gugak Center for his gayageum compositions (SR 373CD, 2013). 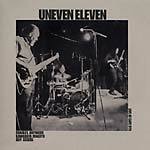 Comes in a six-panel digipak; Includes 20-page booklet.